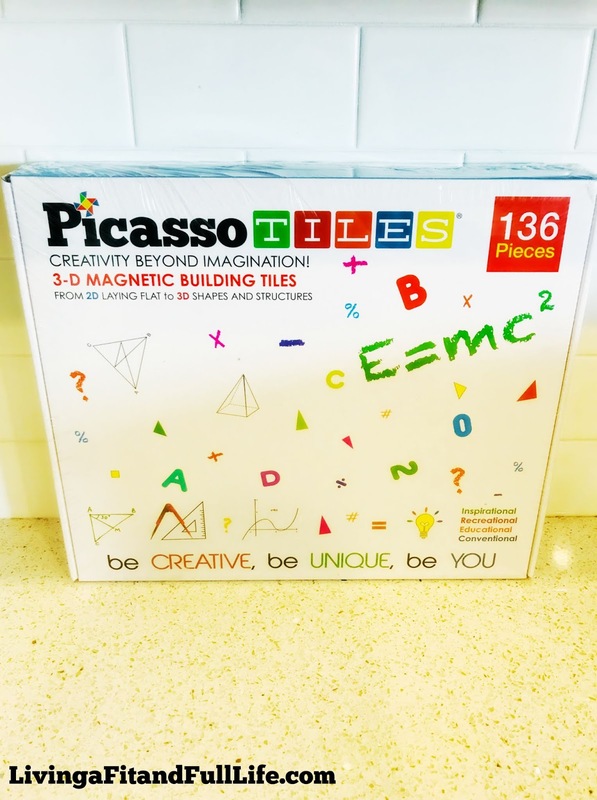 Living a Fit and Full Life: Camp Out and Build Big with PicassoTiles! PicassoTiles has done it again. PT136 Math, Science, and Art All in One Set brought the two counter-intuitive development areas together enabling the kids to learn by playing and bring out the best of both being artistically creative while technically and statically advanced at the same time. PTC20 camping adventure set makes children pretend to camp out at the comfort of their home and also enhance the first campout experience at a young age to learn survival skills. PTC20 camping adventure set is perfect for role playing and developing language and social skills, sparks imagination by camping outside or in the living room. Never too early to start developing kids creativity, imagination, and language & social skills. Children can cook hot dogs and steaks to learn how to share, talk through walkie talkie to practice expressive language skills, use binoculars to pretend to be an adventurer. Social development, teamwork and collaboration are critical to success in today's world. PTC20 camping gear tool set encourages children and/or families to play and spend time together. PTC20 camping set set is not only for kids, but also for adults. Parents can play with kids and tell stories. PTC20 provides children and families variety of entertainment and bonding time together. 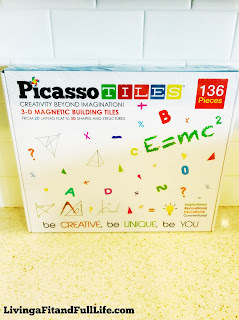 Camp out and build big with PicassoTiles! 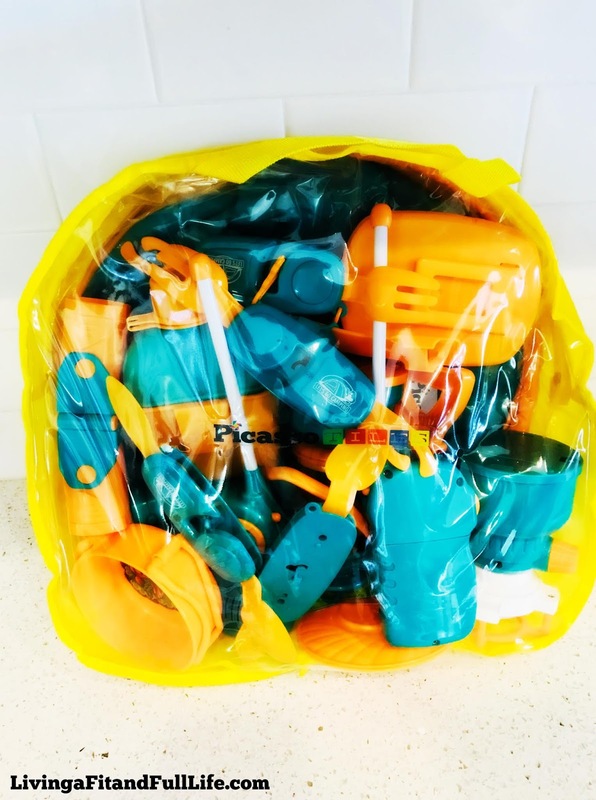 As a mom of 4, I'm always on the hunt for toys that will keep my kiddos entertained. PicassoTiles 136 Piece S.T.E.A.M. Building Block Set and PTC20 20 Piece Camping Gear Tools Adventure Set do just that! 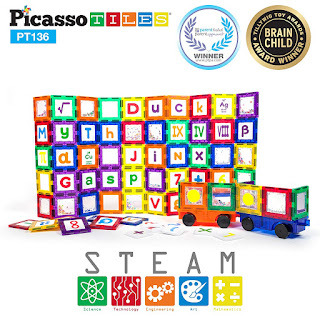 PicassoTiles 136 Piece S.T.E.A.M. Building Block Set is a set that all kids need! It has 136 pieces so there's no limit to what kids can build. It comes with 16 Craft Arts, 2 Car Trucks, 2 LED lights, 14 Symbols (23 Styles), 26 Alphabets, 10 Numerals, and 66 Frames. I love that it's educational yet allows kids to express themselves. Another thing I love is how well my kids play together with this set. It's the perfect set to keep kids entertained! 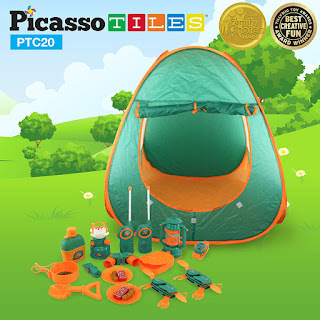 PicassoTiles PTC20 20 Piece Camping Gear Tools Adventure Set is awesome! I love that this set has everything you need to mimic a real camp out. It has a tent, pretend food, plates, lantern and even walkie talkies. This set is the perfect set to set up in the living room and watch the kids entertain themselves for hours. My kids have been playing with this set non stop and absolutely love it!